finally we have definitive proof that at least one of the ameraucanas is not a rooster. all of the other girls from our new flock of backyard chickens have been laying for weeks, but no blue eggs from the ameraucanas. we were beginning to think they might be roosters ( though they were lacking other very obvious rooster traits ) or they were doing a good job of hiding or eating their eggs. but, whoohoo, today we had a surprise in the nesting box! they don’t taste different but for some reason having blue eggs in the fridge adds a little more fun to the cooking routine. 352/365. 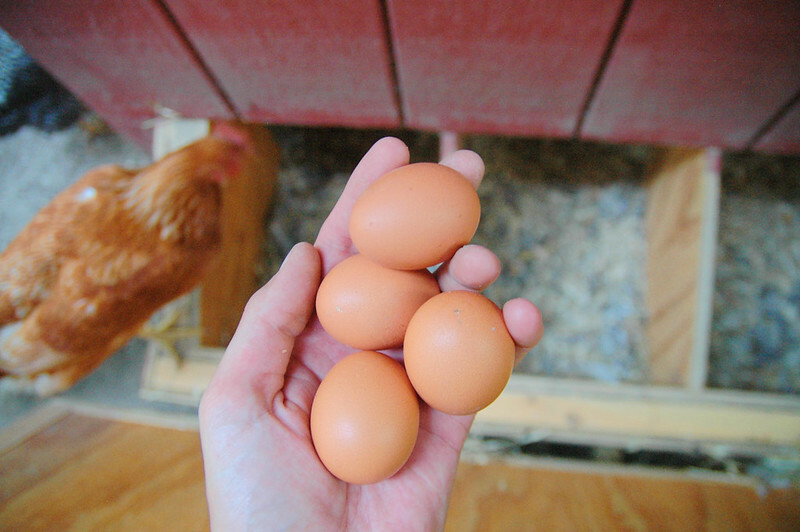 a counterintuitive observation about backyard chicken flock size and the number of eggs on hand. since we downsized our flock from 8 birds to 4 and got out of the egg distribution business we have way more eggs on hand. before with a market in place, we’d sell or give most of the 56 eggs The Girls produced a week and found we were often short of eggs for our own use. 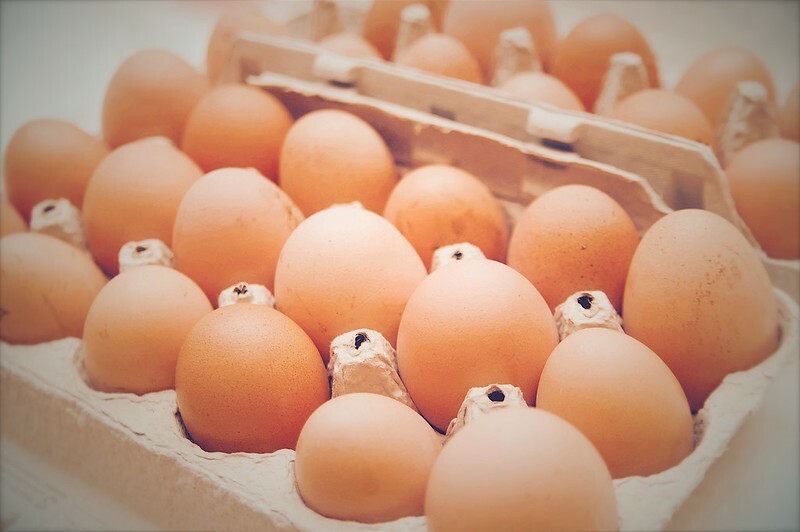 now, without any regular customers – whoooweeee – 4 eggs a day can pile up fast! in hindsight, 4 hens is the absolutely wrong size flock for us. too few eggs to make it worth the effort to set up regular customers and too many eggs for our weekly needs. 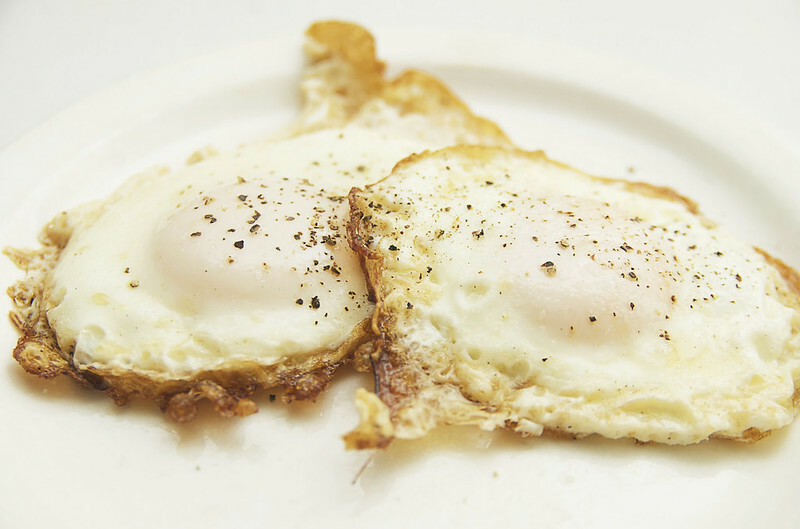 recipe: how to cook perfect fried eggs ( hint, use ghee *and* butter ). when you have backyard chickens you discover the divine pleasure of a perfectly cooked, fried egg straight out of the nesting box. and by perfectly cooked, i mean crispy edges with tender whites ( not snotty! not overcooked! ) and runny yolks. it’s a tough trick to get the trifecta of crispy, tender and runny and i could never get it consistently until i read this cooks illustrated fried egg recipe ( great magazine, highly recommended ). it explains that yolks and whites set at different temperatures. yolks set at 158F and whites set at 180F, so the trick is getting the whites to cook before the yolks. you can get the whites to set first using the “hot and fast” method by using a fat with a high smoke point. drop the eggs in a sizzling hot, hot, hot pan and the whites set before the yolks know what hit ’em. the cooks illustrated recipe recommends using a vegetable oil, but what has a higher smoke point than almost any vegetable oil and has a delicious buttery taste that you want with a fried egg? 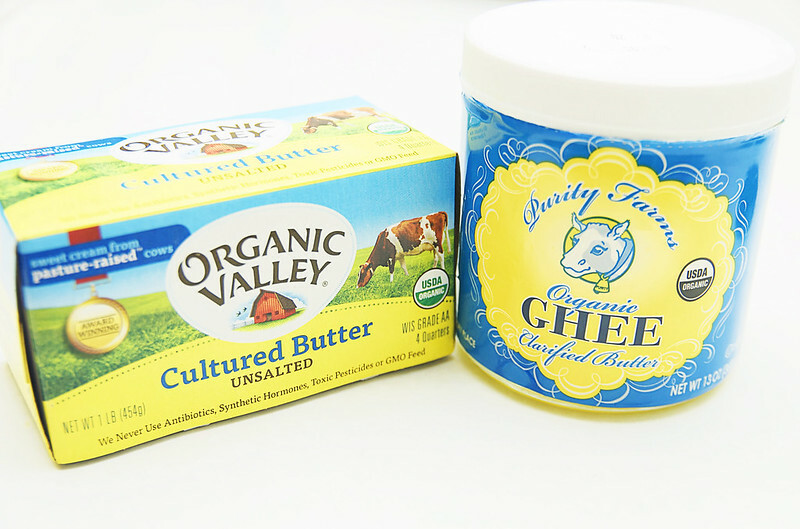 ghee ( aka clarified butter )! throw in a few tablespoons of butter into the pan right as you add the eggs to add a boost of extra butteryness. awesome eggs every time. you can take this general philosophy to its logical conclusion and jump right on the crispy egg train. – add butter and quickly swirl around pan ( this is a little tricy because you don’t want to burn the butter. act fast and don’t burn yourself ). – remove from heat and let stand covered – about 30 seconds will get you runny yolks, 60 seconds will get you soft set yolks and a few minutes will yield medium set yolks. i typically let sit until the layer surrounding the yolk turns white which is a good indicator the whites are completely done and i avoid serving snotty eggs. at that point the yolks are right between runny and very soft-set. The Girls started laying eggs! 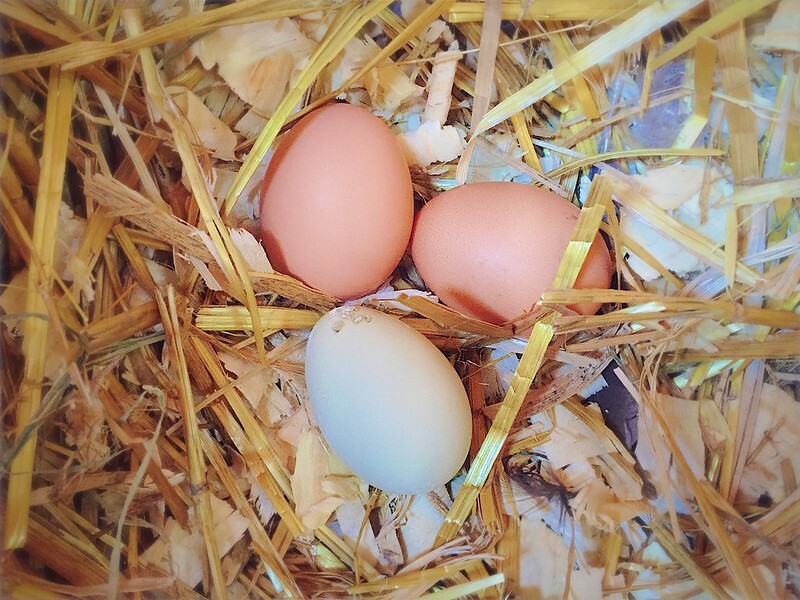 kris went out the coop at the end of the day to check on The Girls and happened to look in the nesting box and discovered they’ve started laying eggs! whooohoooo! fresh eggs! it seems like just yesterday we were attempting to teach frida to not eat The New Girls. finally, fresh eggs from The (new) Girls! some time ago we gave away The Old Girls to a nice farm in the country. after two full years of laying they weren’t producing many eggs anymore and were old enough that they probably wouldn’t have tasted any good on the dinner table. as luck would have it, a local organic pumpkin patch was looking for friendly hens who were used to being handled by children to add to the friendly farm ambiance for their customers. a win-win for old girls! we wanted to get some new girls that were close to laying age and got a tip that if we hung around the poultry barn at the end of the county fair we could probably pick up some 4H hens after the poultry competitions were over from kids who didn’t want to take their chickens home. so we did! and we did! we got the blue ribbon winning blue-laced wyandotte and an americauna that took second place. later, we bought two year-old black marans to round out the flock. i haven’t taken many pictures because right after we got them they went into moult, lost a bunch of feather, stopped laying ( this is a perfectly normal seasonal process ) and looked rather pathetic. but now after about 2 months, they’ve got their feather back and have started laying again! 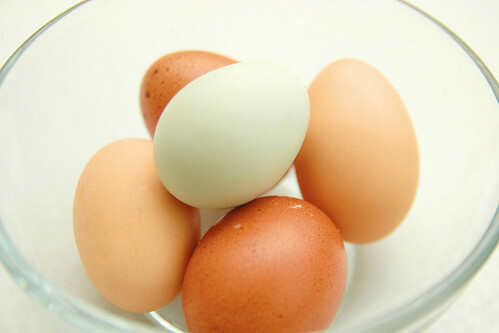 so we’re very, very happy to once again have a supply of super fresh, super tasty and super colorful eggs ( the americauna lays blue eggs, the black marans lay the chocolate brown eggs and the wyandotte lays regular browns ). 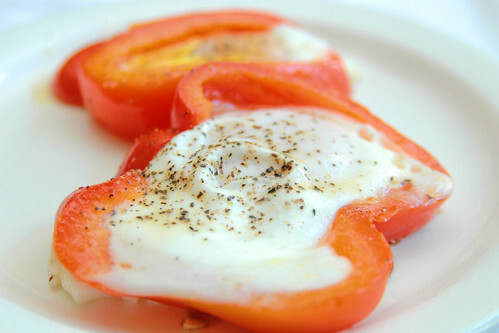 recipe: red bell pepper ringed sunny side up eggs! 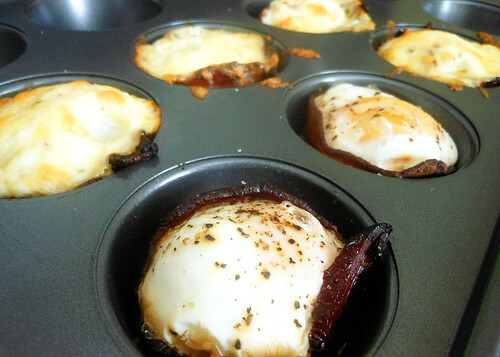 here’s an easy but satisfying twist on regular ol’ eggs. slice a cross section of red bell pepper so you get a nice circle-ish shape. take care to cut it so it will sit flat on a pan. heat both sides of the pepper in a frying pan for a minute or two, so that the pepper starts to soften but not too much. then, crack open an egg and put it right in the middle of the pepper. carefully splash a bit of water in the hot pan and cover for 3-4 minutes. the steam from the water will cook the egg whites but leave a proper sunny side up soft yolk. acceptable modifications include adding crushed red pepper flakes and pepper jack cheese. 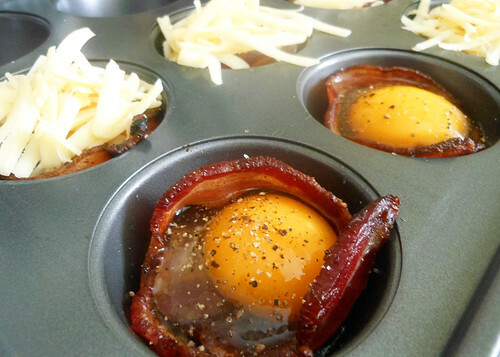 recipe: bacon wrapped eggs with cheese. as soon as i saw this video for bacon wrapped eggs i knew i had to try it. i mean, how possibly could you go wrong with bacon, eggs and cheese? and it’s really simple, as it doesn’t really take much longer to make than regular ol’ bacon and eggs. first, you brown some bacon ( pssst! organic prairie uncured bacon. ) – but don’t get it crispy! 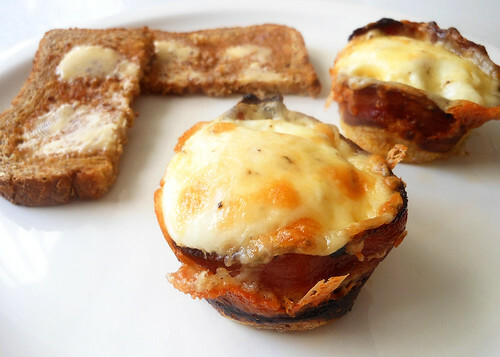 then you place a full strip around the wall of the cup of a muffin tin and a few more bits in the bottom. 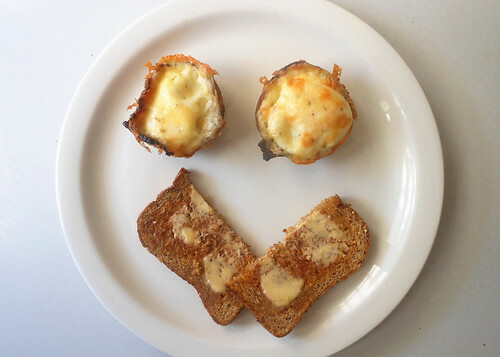 crack and egg in the cup, sprinkle with a titch of salt and pepper and add your favorite cheese ( today we used organic valley raw sharp cheddar ) on top. of course, if you wanted to fancy it up you could add some sauteed garlic or chives or whatever strikes your whimsy. then, place in it a preheated 400°F oven for about 10-15 minutes. how long depends on how thoroughly cooked you want the yolk. i like runnier yolks so i put it in for 10 minutes. after a bit, they should come out like so. it might be hard to tell, but two of them don’t have cheese added because, weirdly, odin said he didn’t want any. i swear, sometimes, i wonder if he’s my kid at all. part of a complete breakfast! or at least a breakfast complete with spelt bread in an attempt to sort-of abide by my gluten free lifestyle ( spelt gives me less “trouble” than wheat ).